At the foot of Grand Cru Schlossberg, surrounded by Clos des Capucins, matriarch Colette Faller along with daughters Laurence (wine-maker) and Catherine make world-class wines. Year after year Domain Weinbach rises above what other producers do the same terroirs, which proves the greatness of the domaine. The wines exhibit amazing depth and density, outstanding body and balance, and are sublime one the nose and on the palate. 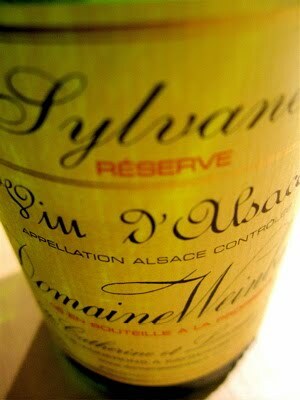 In addition, since a few years the tendency of Domaine Weinbach is to aim for more restrained residual sugar levels. 2007 Sylvaner has a broad aroma of crushed grapes, rye-bread, spices and citrus. The taste is compact, with strikingly rich fruitiness in a medium rich body. Firm acids gives both spine and freshness, enhanced by a trace of characteristic bitterness. Perfect partner to butter-fried scallops. Price: € 12.